Channel Your Inner Librarian… and Get Researching! Peruse your top competitor’s websites to see what keywords they mention most. Start with terms that are highly relevant — terms that your website visitors would use when they’re looking for exactly what you do. Create lists of possible keywords, then roughly group them by type and search volume. Beware of search phrases containing one or two words, which are highly competitive and also less likely to convert into customers. Terms with three or more words are likely to be closer the sweet spot for lead generation. Even though the multi-word phrases often have much lower overall search volume, they will deliver more qualified visitors to your site. Let’s take fictional entity Bob’s Builders, a builder of custom homes in Pasadena, California, and operated by Bob Stevens. The different search terms used to get to the website can easily be grouped into Branded and Potentially Lead Generating keyword categories. A business website will typically rank well already for most branded terms. Where things get interesting though is with the potentially profitable, lead generating terms. So you’ve researched for hours, reviewed your competitors’ sites, and you’ve got a pretty tight list of target keywords for your site. If you haven’t already asked your marketing team for a “keyword wish list” do it now. Keep things simple initially and focus on phrases that the site is currently showing up on the SERPs for. Google Webmaster Tools gives decent data on what terms the site is ranking for and also the terms that are driving your website traffic. The rank checker tool from SEOmoz gives slightly rosier results, showing SERP placements about 5 better than Webmaster Tools. If your business is using paid search, you’ll have a different list of keywords to target specific to your paid search campaign. Issues of organic ranking, competitor activity, and bid cost will help define ideal target terms for your paid search campaign. One benefit of paid search is the keyword analysis opportunities that you get once you have paid for top placement for terms that the site would not normally rank for. There will always be a few terms that the site is struggling with organically, and a modest PPC budget can help by boosting the site’s visibility for terms it’s ranking poorly for. If a term is not leading to visitors filling out a lead capture form, and the visitors from that term are not hitting the conversion goals, then it may be time to eliminate the term from your list. If you have accumulated enough visitor data to make an accurate assessment, and all signs point to failure, why keep trying? I’d say it’s time to dump that keyword, or put it on the back burner and try again later once your site has enough new relevant content to satisfy those visitors. Ideally the terms you select for your initial keyword target list will appear in your website analytics with enough frequency to make the sample size large enough to allow for accurate analysis. Once your site is engaging visitors who enter for one term, it is likely that it will start to rank for an expanding list of search queries over time. You are on the right track when your site is ranking well for a term, your website analytics show profitable visitor behaviors for visitors enter using that term, and you can attribute form fillouts to the term. If these things are not happening then refocus your efforts towards more profitable terms. Moving forward, carefully consider visitors arriving using branded terms versus lead generating ones. Visitors entering using branded terms are likely to already be aware of your company. They may be a current customer, brand advocate, or strategic partner. As you are studying your website analytics for lead-generating activity, it is ideal to segment off as many branded terms as possible. For many sites the company name is a leading search term. Choose the clear volume leader and create a Custom Segment in Google Analytics. After clicking Create Custom Segment, select the Keyword dimension, then select Does Not Contain, then type in your top branded keyword. Why exclude brand-related keyword from some analytic reports? Because they are just downright boring, that’s why! More importantly, segmenting allows you to better analyze the behavior of your prospects. Prospects are not as engaged with your content as your customers or advocates, and they do not necessarily have a favorable opinion of your company… yet! Once you segment out branded traffic you will get a better picture of the behavior of your sales prospects specifically. How they interact with your site will likely show you a few areas that need improvement. Testing new website improvements is the final critical step in finding long-term success online. There are countless additional ways to find profitable keywords. 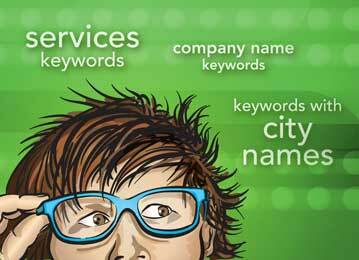 The goal is to have one or more profitable keywords working for your site and generating leads for your business. Once you have established your site for one term, focus on doing it again and again, one keyword at a time. How is lead generation working on your website? Please share your tips below. Sound advice. Well explained too, I’m going to get my own glasses out. Keep these posts coming! Thanks for your comment, Helen. Love your blog, too. Great post, simple and easy to understand! So many times people start to talk about keywords and over complicate the matter. It is all about how people search – “many people know Bob personally but not his company name” – I love that! Thanks for stopping by, Robin. It is amazing how many search performance discussions never get to the point of discussing it term by term. I think most smaller businesses are better off focusing on two or three lead generating terms and ignore the rest.